Our little guy was a clown this year....and was a sticky mess by the end of the day. We enjoyed our walks...crazy he's already out his stroller and riding his strider bike. Nothing like a weekend having the kids and this little guy home for a visit to rejuvinate my spirits! Dog Gone Cute Blog Hop + Give-Away! Oh how fun Lorna's Dog Gone Cute Blog Hop has been this month! I got mine finished just in time for my "hop" day today. I used my favorite dog pantograph.to quilt it and...wellllll....okay, the binding isn't on and I just realized I didn't even snap a picture of the backing. I geuss that gives me a great opportunity for more show-n-telling during the final linky party starting November 3rd! Right?! (Btw...I plan to use a solid black binding.) But seriously, wasn't this pattern so fun and easy!! Thank you so very much Lorna! And if any of you are are like me, as soon as ya finally finish a quilt, ya run to the nearest person (in my case, my hubby) and dramatically present your finish...you know, like they've never seen it over the last month of it's production! LOL!! (God bless them for their patience with us! )Yet, with complete disregard of that fact, you dramatically present your finish anyways! So lucky am I that he says: "I think this one is really my favorite Val." (I just love my guy!!) And I have to agree! Having been a house full of Jack Russells over the past twenty years, I have to say, this quilt will hold a special place in all of our hearts and be well used. I used the 15" block pattern and this quilt finished to be 56"x60". The middle row of pups going down were created in honor of the Jack Russells that have been in our life over the last twenty years: Lily, Jackson, Cami and Frazier. Yes, and below is Jackson posing with HIS block. (Such a ham I know! LOL!!!) He's just always close by...Cami was curled up in a ball on the couch sleeping, unaware of anything else going on. I'm going to tell you though, what differentiates Jackson from all the other dogs in our life is the that he is THE only dog we have raised from a pup. All the other dogs in our life have been rescue dogs. Which brings me to ask you...what is it that you love about your favorite pup(s)? For me, I absolutely love Jackson's sincere loyalty to me. He is my constant companion. My hubby snapped this picture of us as I was creating this post and texted it to me saying..."Seriously!" Yeep! Seriously! (LOL!!) As much as I loved working with rescue dogs and giving them a good home, Jackson was my empty nest pup. He was the first puppy we ever had. We were new to the empty nester phase of life, my hubby was working swing and graveyard shifts. It was often just Jackson and me during a very lonely, transitional time for me....so thus our bond started and my quilting hobby began. Yes, THE REST IS HISTORY here on my blog. December 2009. Jackson was twelve weeks old here. And hey if you are new to my blog from the hop...let me know so I can return the visit and follow...as I can never resist meeting a new dog lover. Happy Dog Gone Cute Blog Hopping everyone and thank you so very much for stopping by my little spot in the blog world. Here's who else is on the hop today and don't forget the linky party starting November 3rd. You can also check out all our past Tuesday Archives themes by clicking right here. While enjoying the Dog Gone Cute Blog Hop I found a new blog that I enjoyed: Tish's Adventures in Wonderland! I also found it ironic that she had a whole cloth quilt finish too! It's always fun to find new blogs to enjoy isn't it?! Well, welcome to Tuesday Archives Tish!! I don't know how popular wholecloth quilting is....but hey, I'm on letter "W" in my Tuesday Archives theme book and thought it would be an interesting theme to add. Who knows what inspiration may be rejuvinated? I'mhonestly very interested to see what shows up this week. Sometimes the good ol' long arm comes in handy for other things besides quilting. 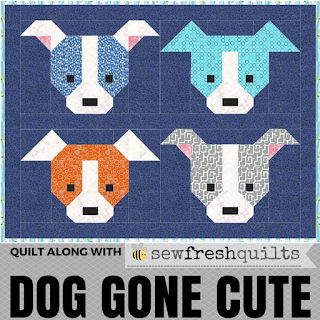 I really can't resist making my pups into a lap quilt, so last night was spent cutting out the rest of my blocks. I found the pantograph platform on my long-arm a handy place to lay all my stacks. I'm thinking by having all the blocks pre-cut, the sewing will be quicker and more enjoyble?? I also added the "theme" cutting tables to my Tuesday Archives notebook ....as I found myself hunched over all night and miss having my taller cutting table. Hubby just said he'll help me look at a solution this weekend. I'll be sure to share any ingenious ideas he comes up with. Hope you've been able to fit in some sew time yourself this week. I used a simple bubble pantograph and a variegated lime thread. It was fun. It was easy. It helped me get my long-arm "warmed" up again. I usually keep a half of dozen quilt tops from the Project Linus ladies around for days like today when I need to get my machine going again. They provide a great opportunity to practice my quilting as well. We're off for our daily walk. I had some extra sewing time this week, which is unusual for me to find during the work week....so I spent my time creating these...in memory of all the Jack Russells we've owned over the past 28 years. I'm thinking of creating six more to make a nice size lap quilt??? 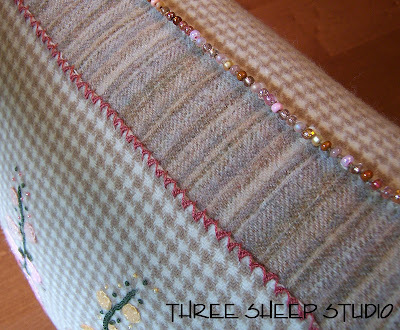 But am going to visit all the others on Dog Gone Cute blog hop to get some finishing ideas. (You can click here to find the schedule of quilters who are participating in this fun QAL.) It's suppose to rain this weekend and with the change of seasons, yard work is decreasing, and as sit here creating this post I find myself looking forward to some time in the studio. THis anticipation makes makes me very happy as my sewing mojo has not been what it usually is...I was getting a little worried! LOL!!! I knew immediately that I'd highlight my blogging buddy Marianne who blogs at Adventurous Quilter. We starting blogging at the same time. We met in person in 2013 as she was on vacation and planned a visit. (My town was on her route.) It's always fun to meet a blogging friend in person isn't it. Marianne has 22!!! Yes! I said 22 vintage sewing machines. 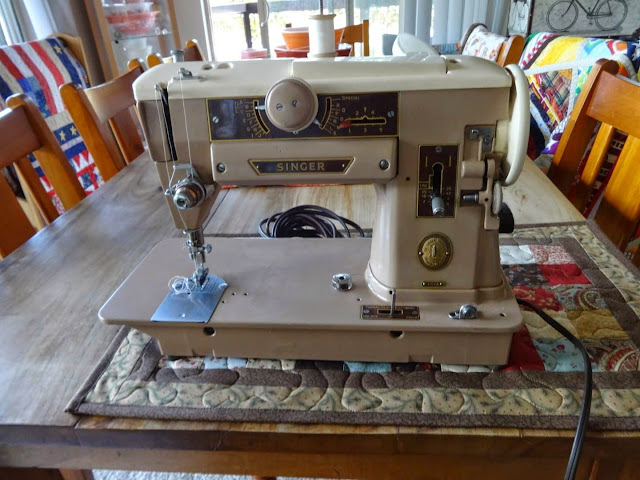 You can click here to see all her Sewing Machines. BTW, Ava continues to be my favorite! Thank youFabrics N Quilts for your linky support! Though this sponsorship is ending, I wanted to wish them good luck in their local endeavors, shows & pattern writing. And hey, If you'd like to be a sponsor in this spot, please send me an email. It was one of my very first quilts made when I starting quilting in 2010. It's the perfect lap size quilt for these cool Fall nights that are creeping in. So I'm wondering, do decorate your home with your quilts? Seriously, my quilting friend keeps most of her finished quilts in totes hidden under her bed! And they are beautiful!! Though this fun sponsorship is ending. Thank you for you Fabrics N Quilts for your linky support! Good luck in your local endeavors, shows & pattern writing. If you'd like to be a sponsor of Tuesday Archives and advertise in this spot, please email me. ....to: Carole who Blogs at From My Carolina Home. Her link #27 under tablerunners was the random number 69 drawn!!! You are September's linky winner of a 15.00 gift certificate to Fabric N Quilts. Maybe this week you want to share how you store your UFO's or WIP. Maybe you want to use this week's linky to create a new post to set a goal to finish some UFO's. Maybe you don't want to think of your UFO's...LOL! Poor little guy....looks so lonely on the design wall all by himself. keep him company as my blog hop day is Tuesday October 27th.. The Dog Gone Cute blog hop starts tomorrow and I can't wait to get some finishing tips. Click here to find the schedule of quilters who are participating. My work week was made a little brighter with surprise happy mail! Thank you Nancy of Pupmom Quilts for the adorable Seasame Street fabric. I'm going to make our little guy a pillowcase to match his Elmo Quilt. Jackson and Cami loved their treats from the boys. 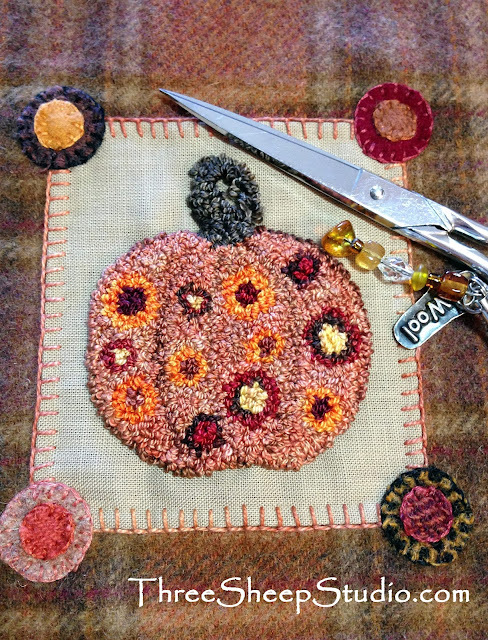 PS - Zenia Rene has a new Saturday linky party called "WHOOMP There It Is"
going on at A Quilted Passion-check it out and show her some linky love!